Composer and electronic musician Tod Dockstader died in 2015 and dementia truncated his work in the electronic studio even before that. However, he left behind over 4200 unreleased sound files. Justin H. Brierley has compiled the best of these into a selection of pieces From the Archives that Starkland has released on CD. The collection is compelling. It is clear that Dockstader’s remaining work wasn’t unfinished snippets. Rather, these are compositions that gel seamlessly, like the sonorous Super Choral and ceremonially percussive Chinese Morf. 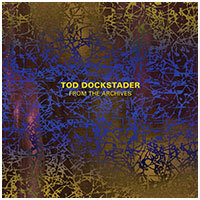 While many of these pieces seem deadly in earnest, elsewhere there is also the characteristic playfulness with sound for which Dockstader is well known. I’m particularly fond of the layering of bells, unpitched percussion, creaking steps, and static bursts on Anat Fort and the thrumming and scraping of Big Jig; Mystery Creak and Creak Creek further this exploration of electroacoustic sounds at play. Todt 1 and Todt 2 work with shimmering overtones and what sounds like rockets preparing for liftoff. Piano Morf is the most epic-scaled of the included pieces and features a plethora of sounds, both pianistic and fantastic in inspiration. All in all, it proves to be a most suitable valediction for an imaginative creator. From the Archives suggests that even Dockstader’s backup files are well worth taking to heart.